Taken from the half-greatest hits/half-new album Still Cruisin’–it featured one side of newer material that hadn’t appeared on an album, while the other side featured classics that had been used in recent soundtracks–it really wasn’t that bad of a record; it showed that the band had returned to its roots in one major way: they could write a great single, even if said songs didn’t trouble the chart any. But one song I’ve always enjoyed from this record, I didn’t know the backstory of until very recently. 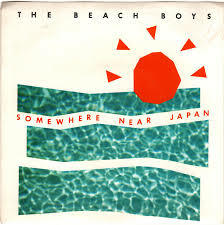 “Somewhere Near Japan” has a production sound that’s not unlike the Jeff Lynne productions of George Harrison and Traveling Wilburys, so it sounds relatively contemporary. A song that is credited as a co-write between Bruce Johnston, Mike Love, Terry Melcher, and John Phillips, the song is largely Phillips’, but its love-song sentiments are actually the true tale of something darker. Phillips’ daughter, Mackenzie, had a public battle with drug addiction, and the story goes that when she and her husband were on their honeymoon, they ran out of money and drugs, and frantically called John for help. “Somewhere Near Japan” is about this incident–though rumor has it that Phillips actually wrote an epic song with two dozen verses.